Are you a Mac computer user? Do you already own an embroidery machine? Great news for ALL Embroidery Machine owners! TruEmbroidery embroidery software for Mac computers will output the final design in the proper format for almost all embroidery machines on the market today. The ease with which this program can create embroidery designs from clip art, original drawings or revisions of off-the-shelf embroidery is amazing. Monogramming is simplified; quilt borders are really fun; the possibilities are almost limitless with just a swipe of the navigation pad. For those who have Apple phones and iPads this is a natural. If you have 5D Professional and want TruEmbroidery, there is a special provision for you. This is the only full-featured embroidery program specifically designed for Mac computers; and it is available to you from Heirlooms & Comforts. Call the shop at 864-639-9507 to get details regarding when Cheryl Keith will present a demonstration of the program for you to learn about this terrific tool for design in embroidery and quilting. There are really good perks for pre-sale orders (details at www.husqvarnaviking.com). Offer ends October 18, 2012. 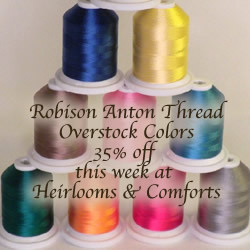 At Heirlooms & Comforts this week we will feature Robison Anton Rayon Thread in colors that are in overstock. A number of great colors are currently overstocked and we are offering only these colors at 35% off the regular price of $5.95 each spool. There are limited quantities of these colors and the offer is good while the supplies last. Our Educator friend Barbara Moore from Husqvarna Viking will hold an all-day Trunk Show and Demo Event at Heirlooms & Comforts on November 13 starting at 10:00 AM. She will be featuring the Husqvarna Viking Designer Ruby DeLuxe and the exciting new Opal line of sewing machines while spotlighting the newest products and projects. There will be great embroidery projects and features, easy embellishments that can be accomplished by almost any machine in our line-up. As many of you know, Barbara has so many great ideas and methods for using H-V products. The newest embroidery collections from H-V will also be featured in this program. There are new feet to learn about, too. The tuition for this all-day event including lunch and door prizes is $10. Sign up right away for a relaxed day of fun and fellowship while learning about new products!! Space is limited. Heirlooms & Comforts will be closed on October 20 for a noon home game at Clemson. Be sure to collect up all the supplies that you need before Friday afternoon so that you are ready for the weekend. Thanks for understanding our position. 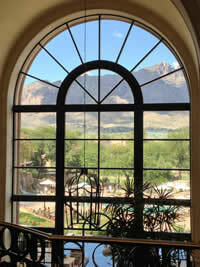 Last week I wrote from Tucson, AZ about Cheryl, Bobby and I being there for the Husqvarna Viking Convention. Now we have been to convention and our heads are spinning for several reasons, not the least of which are the great products and ideas that we discovered with Viking. Read further here to see what some of those are. Saturday evening the three of us had an unbelievable experience at a local Mexican restaurant that was featured on the Food Network show called Man vs. Food. El Guero Canelo is a place where those of Mexican descent as well as their friends who have no Mexican heritage go for true ethnic food. One of those specialties is called Sonoran Hot Dog! There was a Spanish-speaking-only performer singing his heart out and LOTS of people negotiating the dining room; so we decided to eat outside where there was less commotion. Soon a white, well-used pickup truck pulled into the parking lot. As it cooed to a stop we heard a sound like "Maa-aa, maa-aa". Each of us looked at the other wide-eyed and then realized that we were hearing goats in the back of the truck! The additional backup music that began then was Native American drums!! Somewhere across the busy street there were Indians having some kind of ceremony or practice because it continued for the duration of our meal. We could hardly believe what was around us - great Mexican fare and personalities, goats in a run-down farm truck, and Indian drums. Live entertainment for our evening meal. We laughed heartily at our "good fortune" until tears ran down our cheeks. Sunday at lunchtime, after having taken in the very intellectually heavy tour of Biosphere 2 (a scientific project of sustained living conducted in the late 1980's and 1990's), we decided to have our noon meal again at El Guero Canelo since Bobby missed getting the hot dog on Saturday night. Well, this time all the ethnics and their friends were coming in after Mass and Church for a quick Mexican meal. ALL the children were there too. 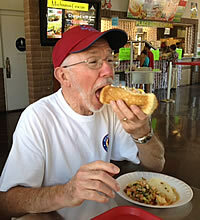 Bobby thoroughly enjoyed the Sonoran Hot Dog, as you can see. We then rode through the desert highways until almost the border to Tubac, AZ, an artist colony, where Cheryl and I did some holiday shopping among the jewelry and pottery. We did a lot of wishful window shopping too. Unfortunately the Quilt Gallery was not open that day. Then it became Monday and we started Husqvarna Viking Convention. Each of the next four days was filled with new techniques, new program modules, and service techniques. Now we just have to disseminate all this to you. In the next few weeks we will try our best. At Heirlooms & Comforts this week we will feature Fall Themed fabrics at 25% off original price. Think apples, leaves, acorns, pumpkins, sunflowers, etc. Make great items for accent in you home or the home of a friend or two. Fall is just getting cranked up, so you can be ready when it hits us full steam ahead with 25% off this week on Fall Themed fabrics. A number of things were spotlighted at Husqvarna Viking Convention for 2012.
a Changeable Decorative Stitch plate for the Interchangeable Dual Feed Foot. We will be able to demo these when you come into the shop. They are very useful. 5D Stitch Editor Plus is an upgrade for all modules of 5D Embroidery. 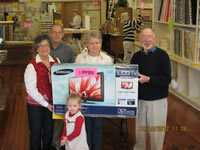 Cheryl has been certified for teaching and selling this upgrade and finds it very user friendly. At class on October 18th she will demonstrate this upgrade and explain how the package is to be sold. You don't want to miss this class if you can possibly be there. Also there is the new TruEmbroidery for Mac computers for which Cheryl is certified to teach. For those who have or who wish to have a Mac computer, this is a powerful program for designing embroidery. She will setting up a demo on this in a few days, so be looking out for the announcement of this time. A third program that is available for your pleasure is 5D QuiltDesign Creator with which you can create a quilting design to be sewn in the hoop on your embroidery machine or on your longarm machine. This program takes the guesswork out of making a design proportional to your border length or block size. Opal 650 and Opal 670 Husqvarna Viking sewing machines are ready for shipment. We were able to sew on these models at convention, and we find them to be outstanding models. Opal 670 has a touch screen, automatic thread cutter, bobbin thread cutter, and 200 built-on stitches with an 8" clearance in the bed of the machine. This is a machine that weighs only about 18 pounds, so it is very portable for taking to class. Opal 650 has 160 stitches and has a touch pad for selecting stitches. Ruby deLuxe is now updated to have the Deluxe Stitch System that portions the amount of thread that goes into the embroidery stitches and the decorative stitches. The front of the machine is redesigned to be very attractive with its red frame, and there are a few new stitches added to the menu. Okay, I will be quiet for now. But, you may find me going on and on when you are in the shop about all these new items. It is always amazing to me the difference in the landscape in various areas of our great nation! Cheryl, Bobby, and I are in Tucson, AZ for Husqvarna Viking Convention this week. Oh, my goodness, how different the landscape is: beautiful, but so opposite from the lush green terrain of home. The cacti are fascinating in shape and color. The flower colors are brilliant. The homes and other structures are so near the color of the ground that sometimes you have to look very carefully to see the homes nestled into the surroundings. We have just arrived here for the week of meetings and learning about new products and software. 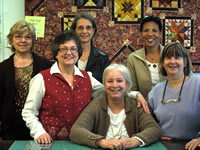 We found already a place to go to see "investment quality" quilts with a southwest theme in many of them. We are hoping to get Bobby to be quiet long enough for us to see this gallery. We'll let you know later how that turns out. Stay tuned! At Heirlooms & Comforts this week we will feature Clean Off the Bolt for all week. We have lately noticed that there are "many skinny" bolts that you can purchase at a skinny price. Take a 25% discount when you take everything left on a regular price fabric bolt. If you choose a sale priced fabric and take all that is remaining on the bolt you can get an extra 10% off the discount. Come and get it! 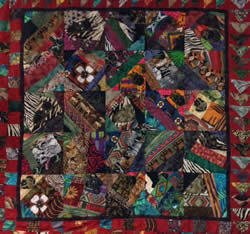 Sienna Harvest Quilt taught by Kathy White is quite a great project. It is made from one feature fabric and one accent fabric, using special cutting instructions. The feature fabric is a fall stripe design with fruits, berries and fall flowers and leaves. The class is Oct. 9 and 23 from 10:00 to 1:00 and the tuition is $36. Come in to see the sample hanging in the shop and to sign up for the class. You will love this one and we have plenty of the fabric just now. There are several new fabric groups that have arrived lately. Among them is Chateau Rouge from French General and Moda. Also there is a group of Kaffe and friends fabrics that are new to the racks. Independence Trail is from Minick and Simpson and Moda. We have three beautiful neutrals from Windham Fabrics and the Orchard House collection. For a long time I have been saying that I found out life is a series of stages. I believe it. One of the early stages of my life was just-out-of-college teacher of English and French to high school Juniors and Seniors. A favorite unit for me was American Literature and Robert Frost, poet extraordinaire. I could go on and on here, but this is enough of a preface to my point here. Having included this poem in a newsletter doesn't necessarily mean that I will never do that again, especially if I think of another Robert Frost poem that suits the situation. Thanks for indulging me. 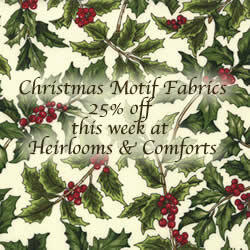 At Heirlooms & Comforts this week we will feature one notions item of your choice at 25% off. You can choose which item you wish to purchase from the notions wall and racks in the notions area of the store. There are rulers, scissors, pins, hand needles, marking tools, cutters, replacement blades, etc. This is for you to decide what you wish to save money on. In stock items only are included in this feature. 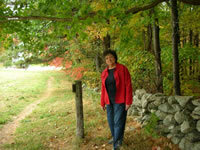 Many of you know about our friend Ann Willis. She is our elderly friend who quilts to supplement her disability income and to be able to "work every day for her living." This lady has a work ethic that is classic. 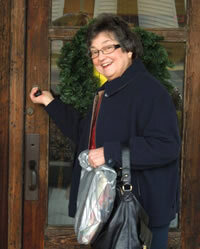 She has recovered enough from recently illnesses and surgeries to be able to quilt again and to finish several quilts. Last week she "hauled" these five quilts in for us to hang and to sell for her to help her pay her living expenses. So, whoever purchases one of these quilts is buying several things: first of all a beautiful product of usefulness; an art object; a means of financial relief for someone who wishes to be self-sufficient; and not least of all sense of having participated in a mission project right here at home for a deserving recipient. Look at the photos and descriptions of these quilts to see if one of them fits a purpose for you. Enjoy the experience of viewing these on line and in person in the shop. At Heirlooms & Comforts we have an item that is new to our inventory: 18" Request weight Quilters Dream Batting that is perfect for items like table runners. It is sold by-the-yard making it convenient to purchase just the length you need without waste. Check it out! This is the last week for taking advantage of several offers from Husqvarna Viking. If you were waiting until the last minute to act on these, the time has come. Simple pleasures are amazing! Bobby and I were talking this week (like senior citizens do) about how his Granddaddy loved raisin bread. From there we went to "how far I had to walk to school", etc. Growing up in the South we had many simple pleasures and unbelievable treats. Remember Nehi Grape Sodas? Or 6oz Coca Colas? Or Orange Crush? And when Pepsi was the new big rival? Remember a small bag of salted peanuts, and you poured them into your cola for a fun treat? My Granddaddy called those Cokes "a dope" because the original formula was thought to have an opiate in it. Simple pleasures: local women processing foods together like canning beans and tomatoes or preserving peaches and blackberries that had been picked on the side of the creek or the road. Women making fruit cakes in the fall and early winter so that they could "cure" until holiday time - never cut the fruit cake the day you make it! Those were gatherings to make chores more bearable. Women visiting over a quilting frame set up in the dinning room or spare bedroom (if you had one) made more pleasurable a time which could have been very solitary without the benefit of TV or iPods. That's when they shared happy times and sad times and became a community. People helped people and became neighbors and friends. Simple pleasures. We can get some of that "community" again by trusting our "neighbors" and by becoming participants in guilds and bees and other organizations of those with common interests and goals. Do you know your neighbors? Have you found a "community of similar interests" with whom you can share ideas and situations? That is part of what Heirlooms & Comforts offers you with our classes and the Free Sew Days that are scheduled for the shop. Do you know the saying "Joy shared is doubled; sorrow shared is halved"? Try it. At Heirlooms & Comforts this week we will feature double punches on the Fabric Club Cards for the purchase of Batik fabrics with a ½ yd minimum cut. We have recently received a number of great batik fabrics from several companies. The batiks are brilliant - gorgeous! 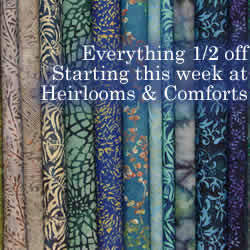 This week get double punches for the purchase of batiks! Right now at Heirlooms & Comforts you can save $600 off the price of a new Designer Topaz 30 or a Designer Topaz 20 AND get a free 5D Embroidery suite. Wow and Wow! The number of units available at this special is limited; so don't wait too long to make your move. Also, there is one only Designer Ruby remaining that qualifies for the big savings of $1250 off and then get a rebate of $250 from Husqvarna Viking. These are super prices and the offer holds only until September 30. At these prices you can get high end machines for prices near what is being paid for machines of lesser value. Come in now! Time flies. This week is ending with mid-September! Next week brings Autumn Equinox! Then 2012 is 3/4 gone! Also the holidays are upon us again! Are you ready? We have all the supplies and some classes that can assist you in your fabric manipulations and sewing for the holidays whether it is for decorating or gift-giving. We are still receiving new fabric groups from companies like Moda and RJR Fabrics. There are new books galore. In the mode of pre-cut fabrics there are Sushi Rolls, Jelly rolls, Bali Pops, Layer Cakes, and Charm Squares that save you time and effort. No procrastinating allowed. Come in this week to get the supplies you need for your projects. At Heirlooms and Comforts this week we will feature Christmas motif fabrics at 25% off regular price with 1/2 yard minimum cut. The selections are at their best just now with several collections from Moda and other vendors of great quilting fabrics. Put together wonderful celebratory items for friends and family while the time is right. That refers to Macintosh by Apple computer. Well, now Husqvarna Viking has an embroidery software suite just for Mac called TruEmbroidery! This suite is designed for those users of Mac who have been patiently waiting for this innovation. This suite has the great features of 5D Embroidery and will output the designs in formats that work for most top embroidery machines including Babylock, Bernina, Brother, Husqvarna Viking, Janome, Pfaff and Singer. Pre-sale of this product is available from now until October 18. When you make a deposit and commit to the purchase you become eligible for several gifts and opportunities. A visit to www.truembroidery.com gives you all the details and answers various questions you might have. At Heirlooms & Comforts we will be offering instruction on the use of TruEmbroidery when shipment of the program comes available in October and after Cheryl gets certification in October. So, save money with pre-sale purchase, get free gifts, get Webex, and get instruction on the use of TruEmbroidery! It could sound like I do nothing but sit in my chair and look out the window. Not true! However, there is a lot that I see from my vantage point in the sunroom/office of my home. For example, I come here each morning to read emails and drink my coffee. There is a squirrel that crosses the roof (I can actually hear him coming) at the same time every morning and jumps from the roof to a limb of the Maple tree just outside my window. You think he is reporting to the boss for work each day? I watched one squirrel the other day dig a hole in the yard and try to lie down in it. 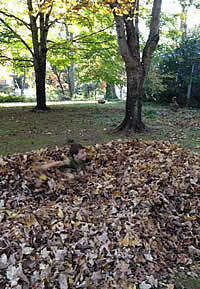 Since he didn't fit, he dug out more soil and tried again and repeated that until he could lie in it and roll around. Why? Scratching fleas? Pretending to float in a lake? Now on Bobby's morning walk he has sent me a text with a photo of a leaf and stem suspended over the street in our neighborhood held only by a spider's web that spans the street and several feet of the two yards either side of the street. The web goes from tree to tree for about 25 feet and the leaf is hanging over the yellow line in the middle of the street. How can a spider get a web that far without support along the stretch? 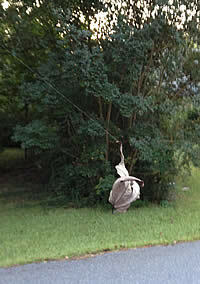 How can a web hold a leaf and stem high enough to walk under for that distance? How can the spider get the leaf attached to the web? Could the leaf have just fallen into place? Nature's mysteries are so fascinating. I read in the newspaper today about a Black Lab dog that traveled on foot for 500 miles from Maryland to Myrtle Beach to reunite with his owner after having been left with "Grandpa" in Maryland. That is for sure a mystery as to how the dog can know how to go that far back to where he had been at home! All of this is not totally unlike the fascinating process of taking compatible fabrics, cutting them into pieces that are then fit back together in patterned assembly to make a beautiful mosaic that is comfortable and can be passed on to future generations for their comfort and pleasure fulfilling some of the need for artful beauty - Heirlooms & Comforts. A mystery from natural bent? At Heirlooms & Comforts this week we will feature Clean Off the Bolt all week long. We have lately noticed that there are many skinny bolts in the shelves. One of them could be a favorite of yours. This week get 25% off when you buy all the yardage left on a regular price bolt and an extra 10% off when you buy all the yardage left on a sale price bolt. Several fabrics made their way to the sale table this past week. You should come to see if the one you have been watching is there. Clean Off the Bolt all week long! At Heirlooms & Comforts right now you can save $1500 on the purchase of a Designer Ruby sewing and embroidery machine from Husqvarna Viking. Unheard of savings! Come in early to see how this happens so easily. No hoops to jump through-just fall in love with Designer Ruby and right away there can be a huge savings of $1500 like magic! These sewing and embroidery machines have very little usage on them and can be called like-new machines. Great buys! Do you remember that to get the best results from your sewing machine you must follow simple rules when threading the machine? Be sure to have the presser foot/bar lifted when you are threading the MACHINE. That allows the thread to fall completely into the tension discs because the discs are open when the bar is in the UP position. When you get to threading the NEEDLE you can put the presser foot/bar down, closing the discs onto the thread. You can feel the difference if you pull the thread through the system when the foot is up - it comes easily. It is tighter and harder to pull when the foot is down. This procedure will help ensure a prettier stitch and even prevent having bird's nests on the back of the fabric or having a tangled mess that clogs the machine and frays your nerves and disposition. Equally important is getting the bobbin set precisely. You must pull the bobbin thread completely into the tension device at the bobbin. I find that I can do this more easily if I hold the bobbin still with my left index finger as I pull the thread around to the tension device. On the drop-in bobbin models if all is quiet around you, you can hear the thread pop into its proper position. Not getting the thread there can make the bobbin thread show on top or create a wad on the back side of the fabric. If you are unsure where the tension device is on your machine come by the shop with your set-in bobbin case or if your bobbin drops into your Husqvarna Viking machine we can show you on our floor models where the device is. More beautiful fabrics keep coming in to Heirlooms & Comforts every week! Just when you think that the designers have no place to go anymore with their designs, they come up with new combinations of beautiful colors and designs. This week we have a group from In the Beginning Fabrics and designer Jason Yenter called Splendor II. It has prints of beautiful with beautiful, soft colors and endearing design. The border stripe is superb. The uses for this group are unlimited. Our feature this week is the Free Pattern folder that we can hand to you when you purchase Splendor II fabrics. The quantity is limited, so come in early to get your fabric and the pattern. During Football Season at Clemson University we at Heirlooms & Comforts indulge ourselves in this sport. Sometimes our customers have difficulty dealing with traffic as the number of cars and people in the area swells to near 80,000. So, in order to get to the game on time and to enjoy our friends and families who participate in this spectator sport, we will adjust our opening/closing times according to game time. We don't know all game times now because TV coverage dictates game times and they choose those late in the process. September 8: will not open because of a 12:30 game. Watch weekly emails for future announcements of game-day closing times. 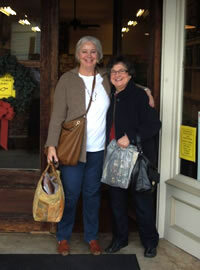 During Shop Hop someone lost a pair of prescription sunglasses at Heirlooms & Comforts. Please call with a description of these to claim them. We feel like someone is disappointed to not have these; so, we have carefully saved them for retrieval by the owner. Several rulers and tools have been left by students in the last few months. We have scissors and cutters and rulers. Come by soon to see if your missing tool is here with us. You know how when you have known someone for many years you think that everyone else you know also knows this person and you forget to introduce your two friends to each other? (How's that for a long, grammatically acceptable sentence?) Well, that is kinda how it is with conditions and solutions for sewing and embroidery situations. This became highlighted for me in the last few weeks. There was a problem with one machine in a class of six machines doing embroidery with the same kinds of thread, the same kind of stabilizer (extremely firm) and the same kind of fabric. This one machine was experiencing thread shredding. The hoop and fabric had considerable more bounce in the sewing process. We looked for mechanical reasons for the thread to break, but were unable to find burrs in any place that the thread passes in the process of becoming a stitch. We change the spool of thread assuming that somehow one spool of thread could be defective. We put in a new needle of the same size that we had in the machine before the problem started and that had embroidered ¾ of the huge design. Finally, I called the Education Department at Husqvarna Viking for advice. We went through all the possibilities for troubleshooting. The one suggestion that Marie made to me that we had not already tried was to use a much larger needle with a different "scarf" and longer eye to hide the thread from the fabric (very tough fabric) and the very stiff stabilizer. We put a Topstitch 90 needle into the machine and it finished the design with no shredding! We all knew that could be a solution, but just overlooked the possibility that we should do that one, simple trial. Needle drag through the fabric on the "up-pull" can make all kinds of things happen - even noise that sounds like metal slapping metal when the needle frees itself from the fabric/stabilized layer and pulls the hoop up slightly from the normal position above the arm of the machine. When the needle clears the fabric, the hoop drops to the bed of the machine making a slapping noise as it bounces to position. If you see a lot of vertical movement of the fabric and hoop (bouncing) during embroidery you could change your needle to one that is larger with a deeper scarf which helps protect the thread in the stitching process. It will make a slightly larger hole as it penetrates the fabric to allow the needle easier exit from each stitch. The larger hole is usually not visually detected in the finished product. Pure logic - I should have remembered at the onset of the problem! Now after all this verbiage, maybe all of us will remember the simple solution. At Heirlooms & Comforts this week we will feature Husqvarna Viking Embroidery Design Packs. Get 30% off any in-stock H-V branded machine embroidery collection disc packages. We have cutwork and quilting and thread velvet and more. Check us out - some are just recently added to the line. These packages are multi-format collections so that if you don't have a Husqvarna Viking embroidery machine, but you have some other one that requires .pes or .jef, etc. you can still use these designs. Don't miss this great savings on Design Packs! At Heirlooms & Comforts from now until September 30, 2012 you can save BIG when you purchase Designer Ruby at our very special price and then submit a request for $250 Rebate from Husqvarna Viking. That's right: H-V will send you a $250 check when you send in the rebate form which we will hand to you at the time of purchase. You save twice and get all the pleasure of sewing and embroidering with Husqvarna Viking and Designer Ruby. You know that at Heirlooms & Comforts you get unlimited classes one-on-one for how to operate your sewing and embroidery machine purchased from us. That is another huge money saver feature as well. We have two of these machines to offer at this deal and the first two people with the commitment to purchase get these machines. Waste no time getting here. There is also a special offer for those who wish to purchase a Designer Diamond deLuxe between now and September 30, 2012. You can qualify for 36 Months no interest from GE Money on the purchase of a new top-of-the-line deLuxe. Ask us. Having just celebrated a significant birthday I find that some things are gaining in importance to me. First of all, another birthday is important and each one is significant - meaning I have made it one more time. Keeping a keen wit and sharp intellect is important. What do you do to maintain a sharpness of mind? I find that I am a little disappointed and duller if I don't get in my daily language puzzles - crossword and jumble. Most days those exercises come just after breakfast and just before physical workout two days a week at the gym. For me, doing something that requires logical and cognitive thinking is very important. I still don't like math puzzles, but I feel sure they too would help me keep my mind sharp. These puzzles and arriving at their solutions are important, but quilt making is also important. There are skills that one must employ in "divining" a quilt "puzzle" that make you use the brain as you would not otherwise. And when you construct a quilt you are exercising skills that sharpen your capabilities. So, when you come down to it, to stay mentally healthy and not succumb to dementia, etc. as you celebrate birthdays you should add more and more quilting and fabric buying as you calculate yardages needed to construct the quilt. This will keep you "ticking" like the proverbial bunny. Now, come to H&C to let us challenge you to more exercises to counterbalance those birthdays. How about this for logical thinking? At Heirlooms and Comforts this week we will highlight the new fabrics from Westminster Fibers that are designs from Kaffe Fassett and Amy Butler and friends who design for Westminster. Oh, my goodness! These are bright and cheerful and will light up your day when you work with them. We also have voiles from Westminster. Have you felt these fabrics to know how light and soft they are? Cissie made a baby quilt from voiles and used silk batting in quilting it, and that is the softest, most supple little quilt I have ever touched. Some of us have already bought our slices of these voiles and the new Westminster brights. Don't get left out! They are in stock and ready for your selection now. Keep your eye out for the new Fall Class Schedule coming next week. Our classes are offered from outstanding teachers like Carolyn Harris and Cheryl Keith and Audra McPeak and Gail Sexton and Sue Wainscott and Kathy White. The first students to sign up and pay tuition are the ones who get into the class. You can do this in person or by phone. We always offer a 10% discount to students for supplies listed by the teacher as necessary for the class. Our staff is really good at helping you choose items that facilitate success in the classes that are offered for your learning and sewing pleasure. Never let it be said that the ladies of Heirlooms & Comforts can't go it alone. There is so much talent, dedication, and loyalty among them that the shop just keeps running along when I am not on the premises. Summer camp for kids was again a roaring success with Judy and Fran guiding the youngsters in sewing the projects. I'm told that the projects were superb and that the girls were model students. Future seamstresses-that's what we love to see. Great products; outstanding instructors; capable, friendly, talented associates; and fantastic finished products made on the best sewing machines available-that's what you get with Heirlooms and Comforts. Let's not forget the super sewing machine service guy-Blue and Gold, Gold Star certified by Husqvarna Viking. That is our edge: our people. At Heirlooms & Comforts this week we will feature packaged batting at a 20% off discount. 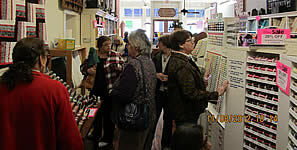 We offer Quilters Dream Batting and Hobbs battings including Tuscany as well as some Legacy by Pellon. There is cotton, wool, polyester, white, natural, black, silk, and soy blend. You have many choices in fiber, color, and size. Measure your quilt tops and come on in for savings on batting in packages. From now until September 30, 2012, you can buy a Designer Diamond deLuxe sewing/embroidery machine at Heirlooms & Comforts with 36 months financing. This is a great opportunity to have the best at interest-free savings. Come into the shop to find out what a great price tag we have on this top-of-the-line machine. All the Designer features will make your sewing and embroidery easy and beautiful. We can give you as many classes as you need to learn to use your machine. Our goal is to have you become successful at your projects.